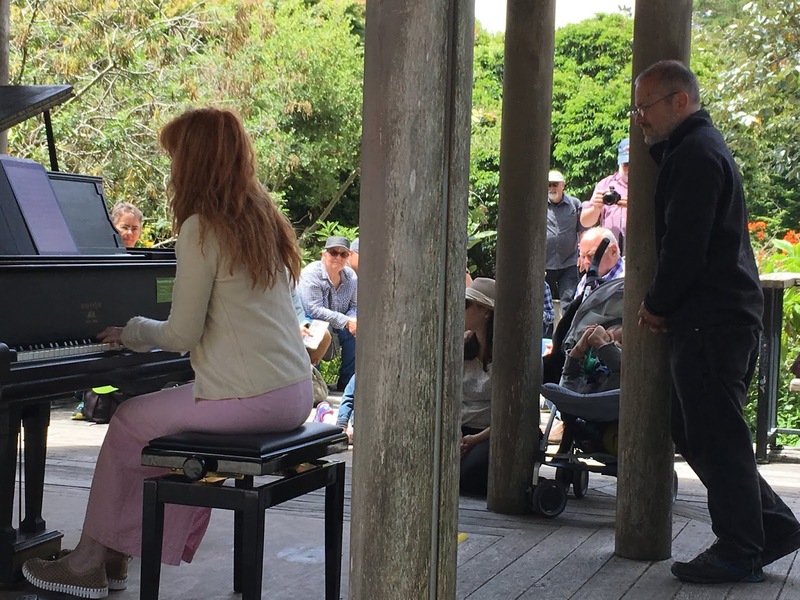 This afternoon in the Exhibition Garden of the San Francisco Botanical Garden, pianist Sarah Cahill presented a two-hour solo recital. This was one of twelve piano performances, all taking place simultaneously and each on an instrument placed in a different region of the Botanical Garden as part of the twelve-day Flower Piano event being co-hosted by Sunset Piano. While the Flower Power Performance Schedule said that Cahill would be playing music by Terry Riley and Meredith Monk, her program was far more diverse, demonstrating the rich scope of her repertoire. Nevertheless, there were three Riley compositions on the program. The first of these was “Be Kind to One Another,” conceived as a reflection on 9/11 and first recorded by Cahill on her A Sweeter Music album released on Other Minds Records. Riley called this piece a rag; and, while he definitely brought his own voice to the music, it was a voice that seemed to reflect some of the more reflective or melancholy rags that Scott Joplin had composed, rather than usual lively examples taken from ragtime tradition. Since the tracks for A Sweeter Music were recorded in 2013, Cahill has built up a long history with this piece; and it was easy to grasp and appreciate the affection she brought to her interpretation. On the more abstract side she had planned to play music from Riley’s Keyboard Studies, but the sostenuto pedal of the Wissner instrument she was playing was not up to realizing this music in a matter that reflected either Riley’s intentions or Cahill’s interpretation. More interesting was “The Philosopher’s Hand,” which Riley originally performed as a solo piano improvisation for the Kronos Quartet album Requiem for Adam. The piece was subsequently transcribed as solo piano music by Toon Vandevorst. Riley had conceived the improvisation in memory of Adam Harrington, son of the Kronos first violinist David Harrington. Pandit Pran Nath had attended the funeral and had silently taken Harrington’s hand. Harrington would later tell Riley that Nath’s was “the softest hand he ever held;” and Riley responded to that observation with his improvisation, which was then added to the Kronos recording. Cahill explained this backstory before performing Vandevorst’s transcription, and one could appreciate the sensitivity of touch that she brought to her keyboard work. Monk was represented by another selection from Cahill’s A Sweeter Music album, “Steppe Music." Her other contributions to the program were her “St. Petersburg Waltz” and “Railroad (Travel Song).” I must confess that my own knowledge Monk’s work has been restricted almost entirely to her vocal compositions. In all three cases one could appreciate the affection that Cahill had for these pieces. This was also true of her performance of “Embers,” the second movement of Phil Kline’s mini-suite The Long Winter, also included on A Sweeter Music. One might not have been able to grasp the implications of warmth in the midst of cold, but this was again music of affectionate reflection. 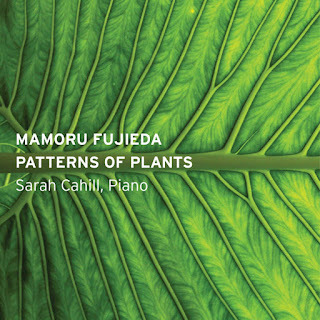 The other Cahill album that was generously represented in this afternoon’s recital was Patterns of Plants, the music of Japanese composer Mamoru Fujieda. The album consists of selections from a very large repertoire of works created by Fujieda, each of which involves transcribing a geometrical pattern identified on a specific plant into a melodic pattern. Two of the pieces that Cahill played were taken from “collections” (which is how Fujieda describes his groups of individual compositions) with titles that cite specific plants, Begonia in My Life (the twentieth collection) and The Olive Branch Speaks (the nineteenth collection). 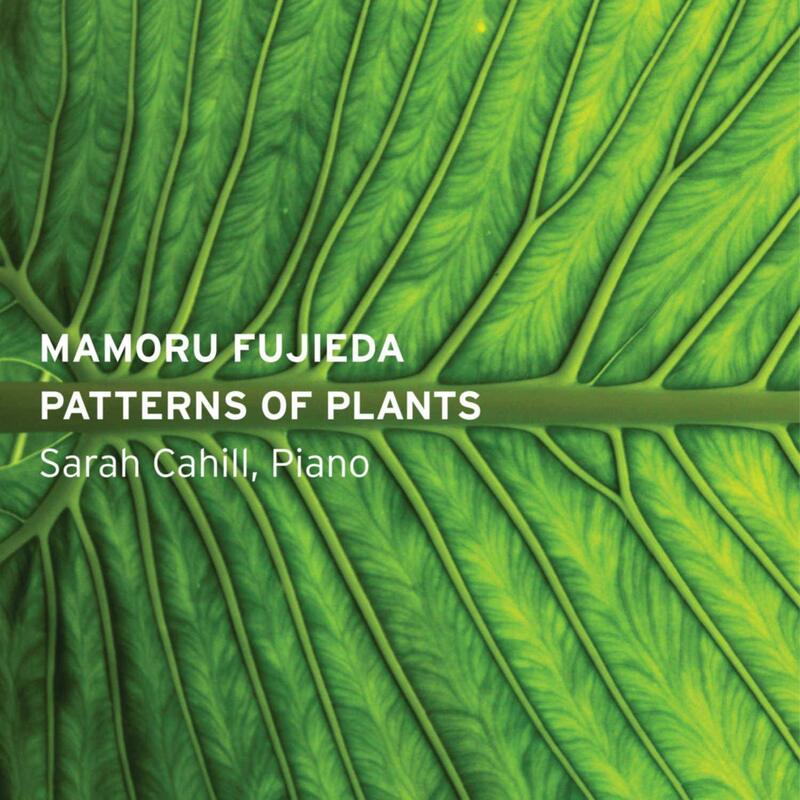 In the absence of images of the plant patterns, it is not easy to think about how Fujieda’s music is associated with those patterns; but there is definitely an elegance to Fujieda’s style that one could not fail to notice in Cahill’s interpretations of his pieces. Other composers on the program included John Adams (“China Gates,” which he wrote for Cahill), Pauline Oliveros (“Quintuplets Playpen,” a rare example of her working with conventional notation), Ingram Marshall (“Authentic Presence”), and Gabriela Lena Frank ( a movement from “Sueños de Chambi”). However, most interesting was Cahill’s decision to begin and end with the same selection, Kyle Gann’s “Going to Bed.” This was his transcription of the music that Philip Glass composed for “Bed,” the penultimate scene of his opera project with Robert Wilson Einstein on the Beach. This seemed to set the tone for the modernist stance of the selections that would follow, meaning that its repetition allowed for reflection on what one had experienced.